Windows logs can be very informative, providing a perfect picture of the activities happening on an endpoint. Unfortunately, the logs can also be hard to decipher when you first start examining them. Graylog uses Pipelines and Data Adapters to enrich logs to make them more functional and easier for you to read. You can easily see the account name was bob and the computer trying to log in was Nicks-MacBook-Pro, but what about that error code? What does 0xC000006A mean? After some Googling, you find out that it means “The user’s password is wrong”, but wouldn’t it be nice to have that clearly written in the logs from the start? 1. 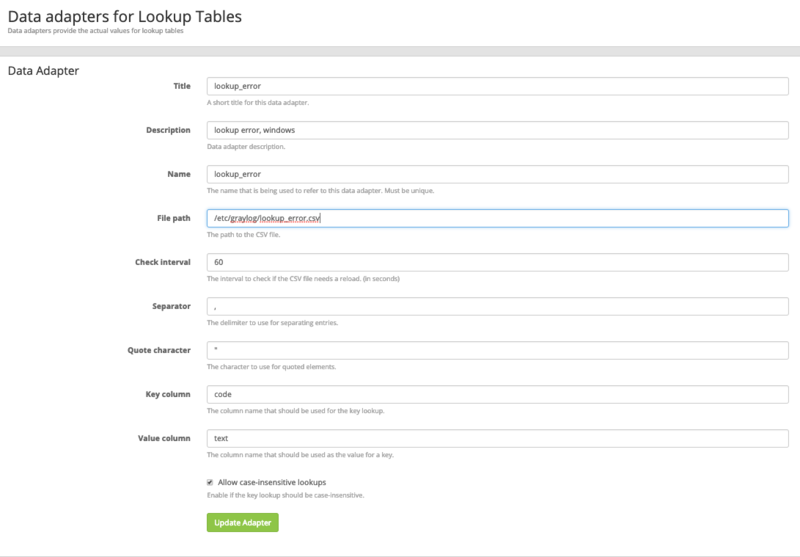 Start by putting in the lookup table on the server. Copy the file to a directory on the Graylog server (in this example /etc/graylog/lookup_error.csv). Now it’s easier to understand why the logon failure happened, and you can add data like this on other Dashboards and Views for your SOC to monitor.